As Chartered Occupational Psychologists, our core professional competence is the objective assessment of people and performance. Assessment tools can drive better recruitment outcomes and help organisations realise the most from people across the whole employee lifecycle. The value of using more scientific approaches to recruitment has long been established. The best performing organisations show candidates how serious they are about their people by using a high-impact, high-credibility recruitment process. 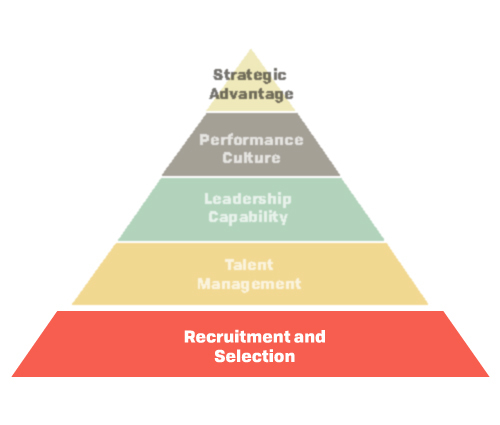 They don’t leave recruitment to chance, they will use more structured, objective methods of assessing the capability of their people and prospective candidates. For Best-in-Class businesses, assessment now plays a vital role across the whole employee lifecycle, with psychometric tools being used more widely across organisations to inform talent decisions. The unique psychological insights gained from psychometrics and assessment centres can help tackle issues of onboarding, identifying high-potential talent, succession planning, retention and boost overall employee engagement and productivity. The challenge when deploying assessments more widely across the organisation is to ensure consistency of the personal qualities being measured and the integrity of how these measurements are being applied. Ensuring an up-to-date and relevant competency framework is in place is key here, to ensure that all assessments are aligned towards realising the actual business goals and objectives. Research shows that companies that apply a consistent competency model across all areas of talent management activity are 5 times more likely to achieve Best-in-Class performance than those that don’t . Clear, powerful criteria that will predict future performance – spot the differences that make a difference. Assessment criteria should truly enable business needs. This requires strong collaboration between HR and line management. Comprehensive, holistic assessments – the full spectrum of candidate qualities that predict successful performance, not just experience or track-record, but underlying potential – e.g. personality, learning aptitudes, aspiration and motivation. Practical, user-friendly output – bespoked reports, your competences, in your vocabulary. Putting clear actionable results from assessments into the hands of your line managers. Generous and equal opportunity for all – to demonstrate their competences to deliver real results to your organisation. The process must not bias against people on the basis gender, social background or personality type. Introverted candidates from minority social groups should have just as much chance. High volume, entry-level workforce assessments – assessing applicants that will shoulder personal responsibility for customer delivery leads to greater performance, line manager satisfaction and also stronger bench-strength for succession, as measures of future potential can be assessed prior to appointment. Assessment solutions can vary from being as simple as implementing a consistent, competency-based interview process, through to the deployment of bespoked psychometric reports to help you identify and develop your future, ,high-potential leaders.